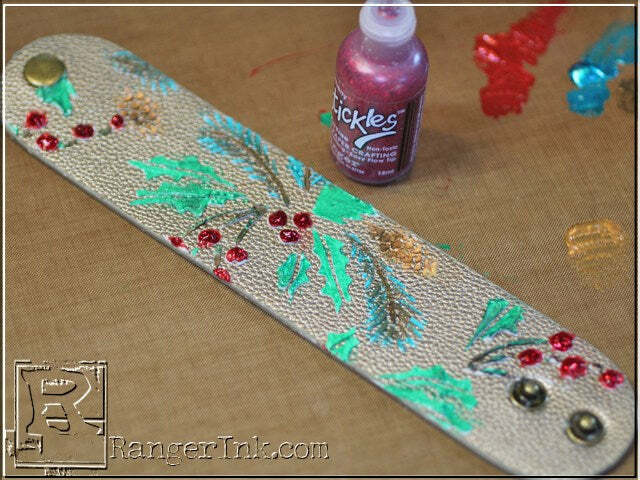 Create a fast and inexpensive gift that is sure to wow using Ranger Ink Texture Paste, Perfect Pearls, and Stickles! 1. Lay cuff, open flat, on top of non-stick craft sheet. Secure ends of cuff with masking tape to avoid shifting. 2. Start in the middle of the cuff (the focal point). 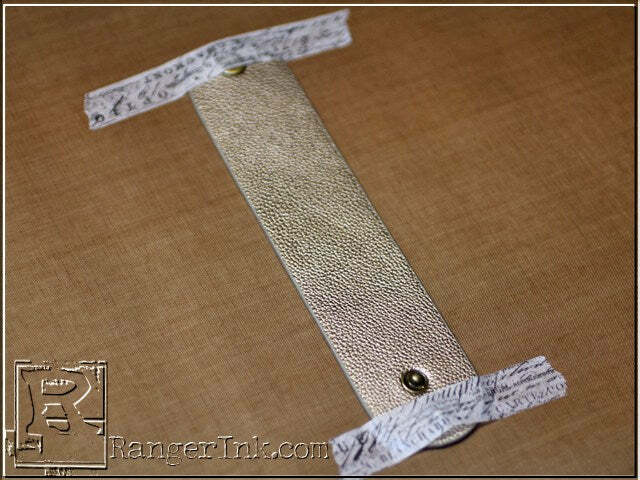 Position stencil into desired position on top of cuff, tape down edges of stencil. Mask off areas you don’t want to get texture paste on. 3. Apply texture paste with offset palette knife over stencil design. Remove excess texture paste and return to jar. 4. 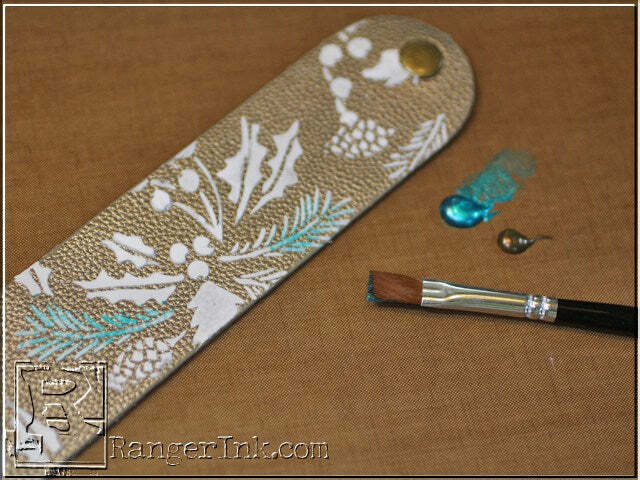 Remove tape and gently lift stencil from cuff. Allow texture paste to dry (about an hour) before repeating this process on the ends of the cuff. 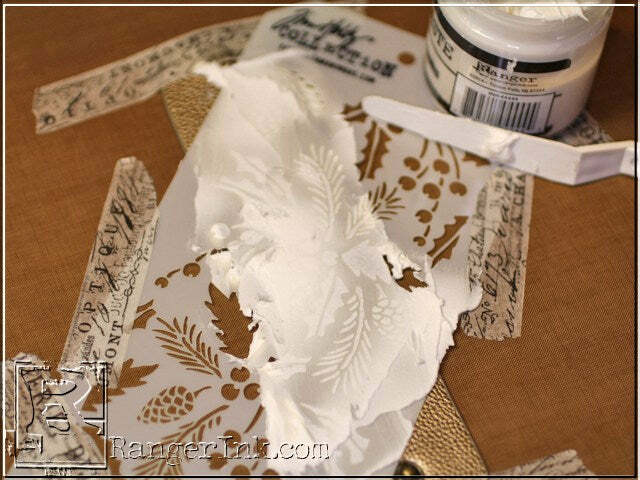 TIP: If you don’t like how you applied the paste, immediately remove stencil and wipe off with palette knife. Clean surface with a damp paper towel and try it again. 5. 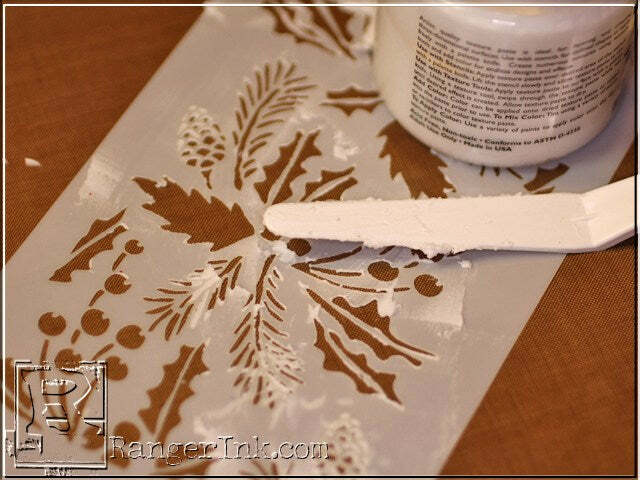 Clean texture paste AND paint off of stencil immediately after each use. Scrape excess Texture Paste off of stencil and return to jar. Wash the stencil with water and air dry. 6. 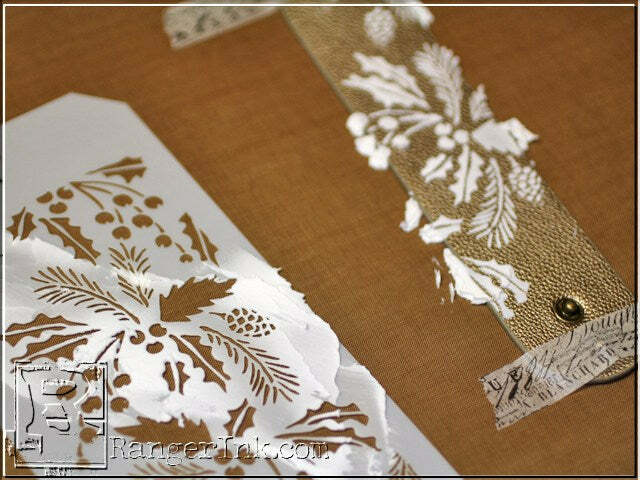 After all stenciled areas have dried (I let mine dry overnight but a few hours should do the trick), you’re ready to paint and embellish. Starting from one end, reposition stencil on top of dried texture paste image. 7. Using the non-stick craft sheet as your paint palette, squeeze out a small amount of Liquid Pearls (dime size amount for each). 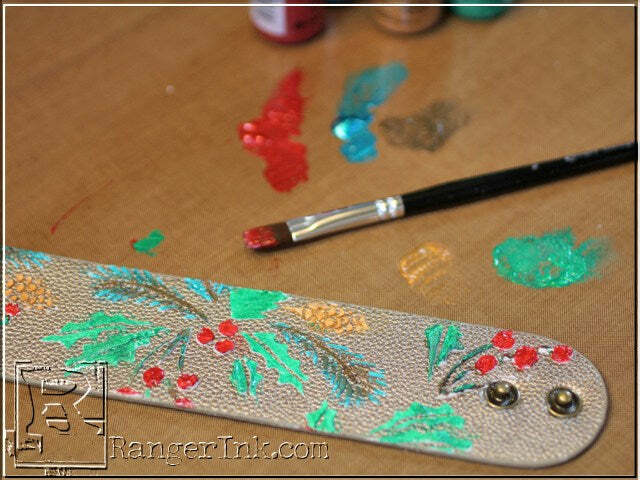 Starting with the Pine Branches (Juniper/Dark Chocolate), swirl Stipple Brush into Liquid Pearls and “pounch” color thru stencil. I started with Juniper and then layered a bit of Dark Chocolate over the top. 8. Repeat process for Pine Cones (Copper Pearl/Dark Chocolate), Holly Leaves (Ivy Green) and Holly Berries (Garnet). Remember to clean your brush between color changes! 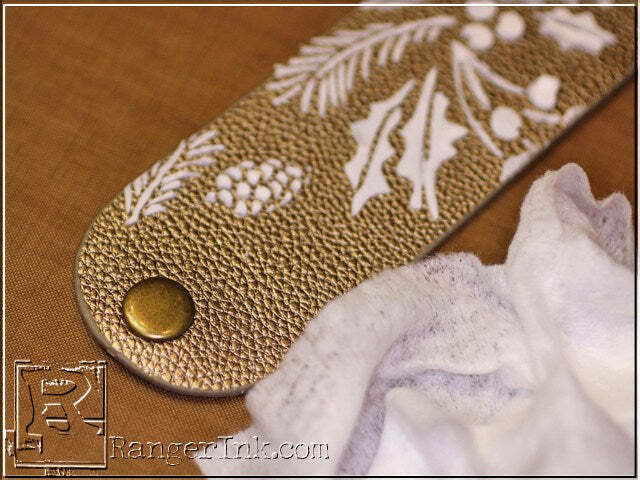 TIP: To extend open time and/or to thin out Liquid Pearl paints (it is paint! ), add a few drops of Multi Medium. Allow painted areas to dry – 30 minutes to an hour. 9. Apply a bit more sparkle with glitter using Distress Glitter. 10. 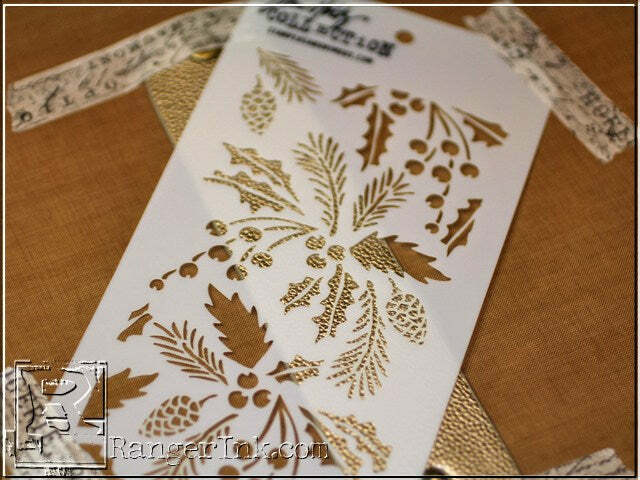 Distress Glitter: Working over a sheet of scrap paper, apply a thick dot of Multi Medium to Holly Berries and pour Festive Berries Distress Glitter over the top. Allow glitter to sit on top for at least 30 minutes before dumping off excess. Let dry at least 24 hours before wearing. 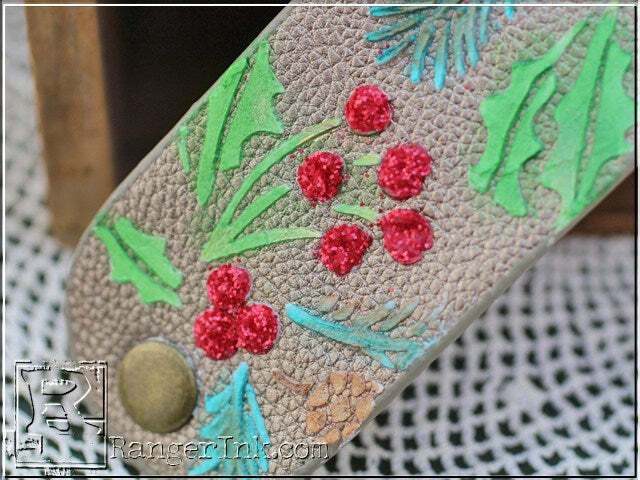 The cuffs are easy to make several at a time, making them a great handmade gift. While you are at it, be sure to make one for yourself too! Colleen Verardi is the National Sales Manager for Ranger Ink. 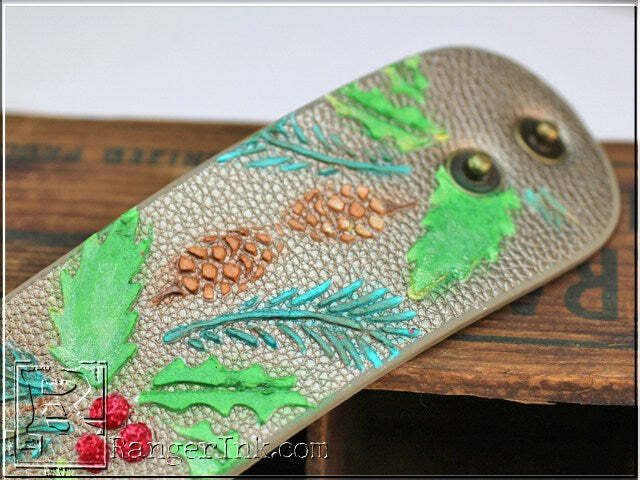 She discovered her love of stamping when she carved her first stamp when she was a Blue Bird in the First Grade. Colleen considers herself lucky because she gets to combine her career with her love of all things crafty and artsy. She doesn’t have a blog but every once in a while creative ideas pop in her head and she gets to share them with everyone here on the Ranger Blog.